Irian Jaya is the official name of the western half of New Guinea, a province of Indonesia since the 1960s. Its inhabitants are generally untouched by civilization, and most of their hundreds of native languages and cultures remain unstudied. Van Enk and de Vries gained access to one of the most isolated parts of Irian Jaya in order to study the Korowai, a tribe in southern Irian Jaya. The Korowai still use stone tools, live in tree-houses, and have no knowledge of the outside world. Van Enk and de Vries provide the first study of the Korowai language and culture. They reproduce oral texts that show patterns of grammar, discourse, and culture, and discuss the phonological, morphological, and syntactical aspects of the language. 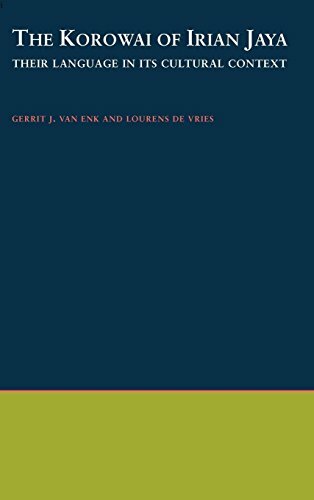 In the process, van Enk and de Vries reveal a number of key semantic fields and conceptual patterns such as kinship, counting, the role of lunar phases, and Korowai cosmology.